As early childhood professionals, we play a significant role in the lives of young children. We are in a position to support their learning and wellbeing, and have a profound affect on their lifelong disposition for learning. The National Quality Framework reforms are a reflection on how important early childhood education is, both in Australia and internationally. The Early Ed Show – 10 episodes down! Another quick self-promotion break – the podcast I’ve been making with my friends and colleagues Lisa and Leanne hit our tenth regular episode this week. As with all professions, it’s important to be continuous learners. No matter what our current level of qualification, there’s always more to learn and be challenged by. That’s why ongoing professional learning and development is so important. It means we can keep up-to-date with the latest research and thinking about the work we do. For early childhood educators, this is even more important. Research and thinking about learning in the Birth – 5 years has dramatically increased recently, and every day seems to reaffirm how important those foundational years are. The knowledge that underpins the sector is changing and updating all the time, which means we need to change and update our thinking all the time as well! It’s 26 July 2016. I live in a country that abuses children. Not by accident. Not as a result of rogue operators, or an imperfect system. As the result of policies and systems that work exactly as they are designed to. Tonight, as a direct result of the policies of our Federal Government which are overwhelmingly endorsed by the majority of the Australian community, a second asylum seeker has set themselves on fire on Nauru. I’m pondering a lengthier post on the challenges to ECEC advocacy some point the line that will no doubt refer heavily to the work she has done over the past 6 years or so, but for now I just want to briefly (and sadly) note that Community Child-Care Co-operative announced today that their CEO Leanne Gibbs will be leaving the role in June. Others that know Leanne far better than I will be in a better position to praise her work in that role. I’m literally writing this about 20 minutes after learning of the news, so for now I want to say a personal thank you to her for a couple of things. Firstly, Leanne has on a number of occasions taken a risk in working with me in some speaking and writing capacities. Someone once said to me that I “don’t work well with others”, and while that is certainly true for many in the sector, I do want to work with organisations like CCCC that put children squarely at the centre of their work – even with the political risks that can follow. This is obviously a fairly self-interested thank you, but I will say it anyway! Secondly, Leanne has guided CCCC through a challenging time for the sector. Large-scale reforms like the NQF, endless inquiries and Governments at a State and Federal hostile to any advocacy could have seen CCCC become neutered or soft-touch. Instead, their advocacy has become crystal clear and part of the national conversation. Check out their submission to the Productivity Commission as a fantastic example of accessible advocacy that tackles a wide range of complicated issues. CCCC has been the standard-bearer for greater investment in NSW preschools for what seems like forever, despite the potential impact on their relationship with the NSW Government. Now that submissions to the Productivity Commission’s Inquiry into Child Care and Early Learning have closed, attention has turned to another big event in early childhood education and care in 2014. Fair Work Australia will be making a ruling on the wages of educators around the middle of the year. One of the things that will decide the final ruling will be whether the wages of educators are chronically low due to the feminisation of the sector – essentially they are lowly paid as the role has been viewed primarily as women’s work, traditionally done for free. The previous ALP Government referred the case to Fair Work Australia as part of its response to the Big Steps campaign. They also committed funds to a Pay Equity Unit within FWA to assist with the application. Throughout last year, and the 2013 election, the Coalition supported the referral of the wages issue to Fair Work Australia. Sussan Ley, the Assistant Minister for Education, said in December “Let’s let the Fair Work Commission do its work and come up with a sustainable increase for everybody.”. At the time, this was a simple political deflection to avoid being perceived as attacking educators. Now that the FWA decision is in the not-too-distant future, it appears that the Government may be changing its approach somewhat. The Australian has reported on a Federal Government submission to FWA, where they have warned that granting wage increases to the sector could have negative flow-on effects to other industries. In a submission to the commission lodged late yesterday, the government said the tribunal’s task was to redress any gender-based differences in pay, not “undertake an exercise in comparative wage justice”. The Government seems to be trying to make the point that FWA is not empowered to compare wages between different sectors or industries, but only to resolve specific gender issues within a specific sector. This is deliberate attempt to refocus the case in a direction far more likely to lead to a negative verdict. The evidence is clear and irrefutable that early childhood educators are underpaid primarily due to the feminisation of the sector. On current figures, only 3% of the sector is male. FWA’s decision that wages were unfairly low for reasons of gender in the social and community sector case was in the context of a sector that employs around 15-20% of men. On the strength of that alone, the case seems relatively open and shut. What the Government appears to be trying to do is direct FWA to not compare between the ECEC sector and more diversely-represented sectors (or even male-dominated sectors), as there can only be one conclusion drawn from those comparisons. It is important to remember, however, that FWA is an entirely independent body and is not directed by the Government. The Government undoubtedly would prefer that in the current political climate of a “budget emergency”, they are not left footing the bill for a wage increase that could be anywhere up to $2 billion. The Government are trying to encourage FWA to shift the goalposts into a position more favourable to them – but that is no guarantee that it will happen. 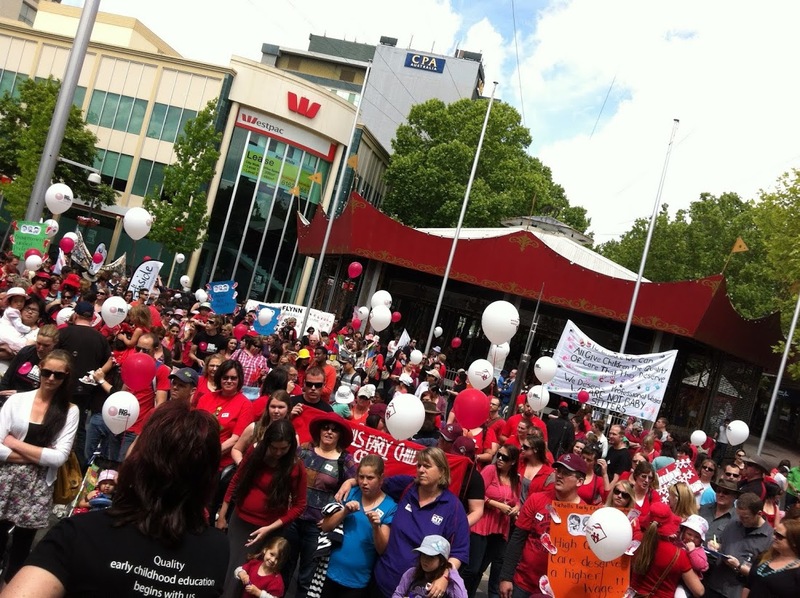 A clear case can be made that a culture of undervaluing the work of women in our society has had the long-term impact of keeping the wages of professional educators and teachers in the ECEC sector artificially low. All that remains is for that case to be forcefully made, and for FWA to hand down its decision.